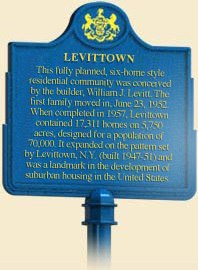 In 1951, Levitt and Sons promoted their new development outside Philadelphia as "the most perfectly planned community in America." Shortly afterwards, America's leading urban critic, Lewis Mumford, quipped that "Mechanically it is admirably done. Socially the design is backward." The second of three "Levittowns," Pennsylvania's Levittown was a massive project for a single builder. Using mass-production techniques, the Levitts pioneered the creation of affordable housing for thousands of families. Intrigued by their huge residential developments, journalists, novelists, sociologists, and planners exaggerated both their novelty and normality, using the term "Levittown" to invoke the best and worst of suburban living. Their mass-produced housing came to symbolize both the conformity of American post-war consumer society and its promise of upward mobility and home ownership. Indeed, after World War II, pent-up demand, returning veterans, and favorable government loan guarantees fueled a booming market for affordable, single-family housing and spurred an unprecedented surge of suburban development across the nation. 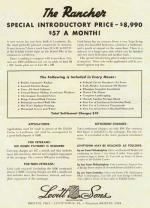 Levitt & Sons advertisement for "The Rancher," circa 1949. Leading the way was Levitt and Sons of New York. During the Great Depression, the Levitts had built their business on custom-designed homes for upper-middle class buyers. Then during World War II, they constructed housing for the Navy at Norfolk, Virginia. Using their military experience to revolutionize the construction of residential housing, the Levitts in 1947 undertook the largest housing development in American history at Island Trees on Long Island, New York, where they built some 17,500 houses by 1951. 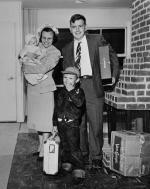 Taking advantage of government-subsidized mortgages, veterans snapped them up as fast as the Levitts could build them. After plans to build a second development in Long Island, called Landia, collapsed in 1950, the Levitts found their second opportunity for a massive housing development when U.S. Steel announced plans to build the Fairless Works, a large integrated plant at Morrisville, Pennsylvania. Levitt and Sons quickly purchased a substantial tract between the site of the Fairless Works and Kaiser Metal Products, then adapted their Landia plan for this location, anticipating correctly that it would become a Critical Defense Housing Area. As on Long Island, the Levitts selected a site near defense industries and built housing to tap a local labor market. In contrast to the piecemeal Long Island development, the "master plan" of their new Pennsylvania Levittown called for curvilinear streets, no houses facing the parkways, and clearly defined neighborhood units within large master blocks. Organized by housing types, the neighborhoods, which ranged from fifty-one to 990 houses, tended to separate income and family age levels, counter to the plan's stated aims. To help provide identity, the street names within a given neighborhood began with the same letter. The plan also centered each master block of some 1,400 houses on an elementary school and recreational facilities, and replaced local shopping centers with a single "mile-long" shopping plaza. Using six single-family house designs, the firm varied the look of houses by alternating the placement of building components on the lots and by offering a selection of exterior pastel colors. To limit costs, the Levitts also limited to size to four small rooms and a single bathroom, reduced room size, replaced basements with radiantly heated concrete slabs, and purchased materials directly from manufacturers. Circumventing union regulations, armies of "subcontractors" assembled pre-cut and "combat loaded" materials. Workers moved from one house site to house site where they performed one of more than 100 tasks in "an assembly line in reverse." "It is boring; it is bad," Alfred Levitt remarked in 1952, "but the reward of the green stuff seems to alleviate the boredom of the work." Coming from near and far, building materials included tiles supplied by the Robertson Art Tile Company in Morrisville and bamboo curtains from Japan, which replaced closet doors. Built-in General Electric kitchens, full landscaping, and an optional expandable attic added to the sales appeal. Bill and Daisy Myers, seated on their couch, Levittown, PA, August 20, 1957. Sprawling over four municipalities, Levittown's neighborhoods were divided between school districts and received uneven delivery of other services. A movement to incorporate in the 1950s failed, in part because of the reluctance of Falls Township residents to share their tax revenue from the steel works. Inadequate provision for adolescents and the elderly created other problems as the population aged, supporting some of Mumford's early criticisms. Nevertheless, many Levittowners were deeply devoted to their community, schools, and swimming pools, and resented "the condescending attitudes of the Princeton types," in the words of long-time resident Gordon Parker. They created a successful community library and celebrated when their Little League team won the Little League World Series at Williamsport in 1960. Do-it-yourself additions transformed the housing stock, and as the landscaping matured, it attracted birds. When Levittown was twenty years old, Parker observed, "songs greet you in the morning and lull you to sleep in the evening as you rest on the patio." Despite its beginnings as a massive, mass-produced housing development linked to Pennsylvania's expanding defense sector, Levittown served many families well, allowing them to own their homes and experience a much-desired suburban lifestyle. Pam Conrad, Our House: The Stories of Levittown (New York, NY: Scholastic), 1995. Diane Harris ed, Second Suburb: Levittown, Pennsylvania (Pittsburgh: University of Pittsburgh Press), 2010. David Kushner, Levittown: Two Families, One Tycoon, and the Fight for Civil Rights in America's Legendary Suburb (New York: Walker and Company), 2009.